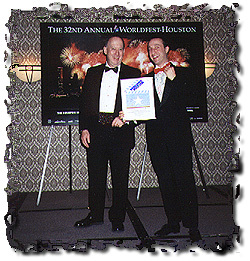 HOUSTON, TX - Casey Carle of East Haddam, CT has won second place (a silver award) at the 32nd Annual WORLDFEST International Film & Video Festival in Houston, TX. Carle’s art video entitled “Soap Bubble Artistry” was submitted in the sub-category “Experimental Video” in which there were 50-60 entries. Overall the film festival received over 3000 entries - spanning from film and video “shorts” through full length, independently produced feature films. Notable winners in the festival’s long history include Stephen Spielberg and George Lucas. BERKELEY, CA - Casey Carle of East Haddam, CT has won a "Best of Festival" award at the Berkeley Video & Film Festival in the sub-category "Video Art". This award is second only to "grand festival award" in the category. Over 125 entries were submitted to the festival's screening committee with only 47 award winning entries presented at the two day festival. Carle's video will become part of a package of award winning works to be offered to cable stations, film centers and college and university nationwide. There are also plans for inclusion in the festival's first ever "web-casting". Congratulations from Festival co-director Mel Vapour included praise on the deserving award and continued success in future cinematic pursuits. BARRIE, ON - Casey Carle of East Haddam, CT has been recognized for his submission to The Canadian International Film and Video Festival with a rating of "Special Commendation" in the sub-category "Experimental Video"
In each category there was a "Best", "2nd Best" and a "3rd Best" award given. Entries narrowly missing these awards have been given a "Special Commendation".